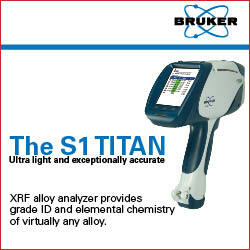 KENNEWICK, Washington – February 13, 2013– Today, Bruker proudly announced the inception of the Titan Detector Shield. Specifically designed to protect the detector window from punctures by sharp objects such as scrap shavings and wires, this patent pending accessory still enables accurate and fast analysis of almost any material. The shield nearly eliminates the chance that the handheld analyzer will be damaged, successfully preventing the hassle and cost associated with replacing a broken detector window. Such protection does not compromise the analytical performance of the S1 TITAN; the instrument still performs as designed, even when analyzing light elements like magnesium, aluminum and silicon. John Landefeld, the Executive Vice President of Bruker Elemental, stated that portable XRF users realize that accidental puncturing results in costly detector repairs or replacements. Landefeld continued, commenting that the Titan Detector Shield, which offers unique and unparalleled protection, gives S1 TITAN operators and owners the peace of mind and better time-up they deserve. The Titan Detector Shield comes available for two S1 TITAN models: the SDD based analyzer S1 TITANLE and the Si-PIN based analyzer S1 TITANSP. When purchasing a new unit, this optional accessory can be ordered, as well.